It appears the order in girls 1600 was Haskell 5:03, Woodward 5:09, Ross 5:16. Photo of start below. Until then, you can tweet updates from the meet to @CCExpress. Results will be posted as soon as I get them. 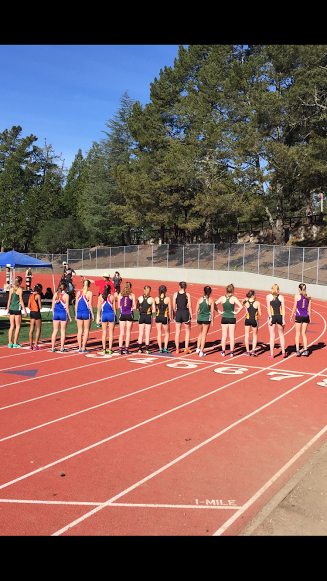 Invitationals include Capital Classic Relays, Sac Joaquin County Relays, Skyline Invitational, Super 7 Invitational and Viking Invitational. If you are attending any of the above meets, feel free to send any updates of outstanding marks and post on twitter @CCExpress. The same goes for any future meets this season. A lot to get to . . . . . . . .the coaching position at Polytechnic High School, Long Beach . . . . . .in case anyone has not guessed, the school's athletic director is the head coach. . . . . .she cannot, and will not, recruit ANY student-athletes from ANY school district outside of Long Beach, as did Don Norford. . . .she or he cannot or will not recognize any potential student-athlete acquired by Poly track graduates. . . . . . . . . . in short, she or he goes by Long Beach City high school, Southern Section and CIF bylaws. . . . . .and trains whoever it is who comes out for track and field as such student-athletes naturally enter as freshmen, and so on. . . . she, or he, is a "breath of fresh air". 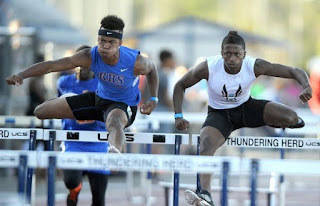 . . . . . . .remember Poly 2014 frosh Kaelin Roberts (11.79, 23.47, 52.52) and Autumn Wright (54.74). . . . . .regardless of what March Track and Field News says. . . . . . both girls have entered Carson High School, of the L.A. City section. . . . . . .IF that is the present state of affairs and these two girls apply themselves to training, then with senior 300 meter hurdler Jeanette Paul (42.53 2015 CIF), Carson High coaches could develop a sub-3:48.00 girls 1600 meter relay team.. . . . . . . . .Clovis High graduate and 2015 Female Collegiate Female Track and Field Athlete of the 2015 collegiate track and field season (University of Oregon) Jenna Prandini is giving up her senior track season and has been signed to a PUMA shoe contract. . . . . .opening up the 2016 Diamond League international track and field season to her, giving her the proper amounts of meet competition prior to the 2016 US. Olympic Track and Field Trials. . . . . . .she can improve on er 11.92 100 meters, 22.20 200 meters and her 21-plus feet long jump marks into the trials, held this summer. . . . . . . . . .would anyone believe that Henry Thomas (Hawthorne class of 1985) still holds the U.S. high school 16 year-old record in the 100 meter dash (10.27) and the U.S. high school 17 year-old record in the same event (10.25 - the boys CIF record) . . . . . . . . . . .as a 17 year-old senior, his last race as a CIF prep in the 100 meters resulted in a 10.52 (-3.8 mps=8 mph), on a Gahr High School track that needed some serious resurfacing. .. . . . . .through age 17 he also ran FIVE non-dual meet wind legal sub-20.80 200 marks, CIF competition, an unmatched national aggragate feat. . . . . . . . . .Micheal Norman (Vista, Murrieta) has become, already, the most accomplished U.S. prep track 200 meter/400 meterr athlete in history. . . . . . . . .his 20.30 CIF boys 200 meter record designates him as number two boy, U.S. high school history. . . . . .his 45.91 400 meters ties the U.S. high school boys nationinal record. . . . . .two questions come up about him. . . . . .he has exceeded the 2016 U.S. Olympic Track and Field trials in both events. . . . . . .I gather that he would most likely enter the trials to, at least, garner a spot on the men's 1600 meter relay team. 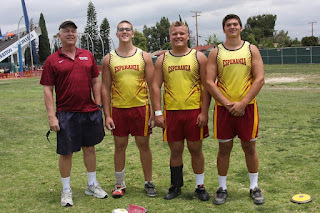 . . . . with the last five weeks of the Southern Section and CIF track and field season, grueling for all prep athletes, as it is, and possible ventures into matching the U.S. high school record in the boys 200 meters (20.13) and/or coming close to exceeding his U.S. high school record in the 400 meters. . . . . . . . .and head coach Coley Candaele having possible headaches in both relays. . . . . .Vista High's fourth fastest 100 meter returning sprinter has a 2015 best of 10.92 and, after intense reseach, I found that Luke Hicks is the second fastest 400 meter sprinter returning to 2016 CIF track. . . .with a 2015 best of 52.19. . . .. . . . can 40.14, the CIF record in the 400 meter relay and sub-3:18.00 production in the 1600 meter relay, be an arduous task of super production for Michael? . . . . . . . .,constantly? . 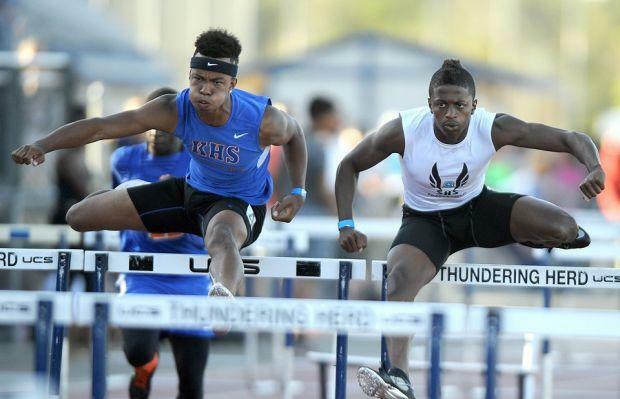 . . . . .well, watch what happens in 2016. . . . . . . . . . . . Micheal Norman was one of two underclass boy sprinters with outstanding 200 meter and 400 meter marks at the CIF state finals . . . . .2015 sophomore Zachary Shinnick (Damien, La Verne) ran 21.10 and 47.19. . . . . . . . . .Tara Davis (Agoura) is the fourth girl, CIF history, to have achieved a wind legal long jump of 20 feet, or farther, and a wind legal triple jump of 40 feet, or longer in the same invitational or championship meet. . . . and, at a wind legal 13.48 in the girls 100 meter hurdles (12th CIF history) . . . . .she is the only girl in CIF history to be extremely adept at two field events and a track event. . . . . . . .as briefly profiled in March 2016 Track and Field News, the Great Oak HS boys, and girls, 1600 meter runners have as good a chance (make that an opportunity of certainty) to break the U.S. high school records in the boys 4 x 1600 meters/mile (returning 1600 meter runners at 4:0648, 4:09.31, 4:09.61 and 4:23.47 from 2015 CIF) and girls 4 x 1600 meters/mile (returning girls, 1600 meters, at 4:40.34, 4:50.26, 4:55.79 and 4:56.21 from 2015 CIF).. . . .if anyone payed attention to the results of the 2016 winter meet, the certainty of both relay records would very well be captured by Great Oak HS. . . .
To read the rest of the email (yes there is plenty more), go to this LINK. Today we chat with one of the top Track and Field athletes in the state of California, Mt. Pleasant senior, Darius Carbin. Last season, Carbin scored in the three jump events at CCS by finishing 5th in the long jump (21'11"), 2nd in the high jump (6'7") and 1st in the triple jump (47'4"). He went on to finish in 2nd place at the state meet in the high jump and raised his personal record to 7'1" in July which you can view HERE. 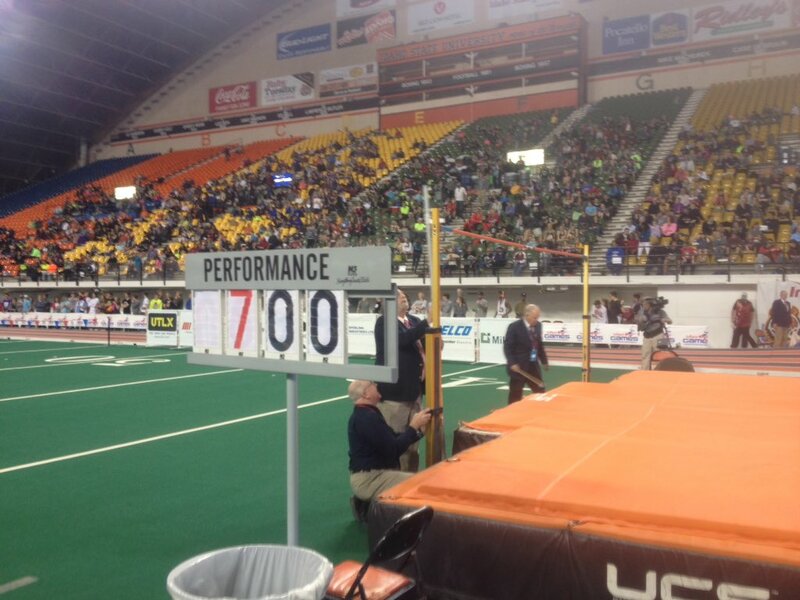 This past weekend, Carbin won the triple jump (47'11.25") and the high jump (7'0") at the Simplot Games. 1) What sports have you participated in aside from Track and Field? Before track and field, I participated in baseball, soccer and basketball. Basketball was my favorite sport before track and field, and that was the sport I competed in the longest after track and field. 2) What were your personal records heading into high school? I don't remember most of my personal records before heading into high school, but I remember that my high jump pr was 5'9" in 8th grade. 3) What were some of your proudest achievements during your first two years in high school? Some of my proudest achievements in my first two years of high school track and field are getting past 6' as a freshman (6'4" by the end of the year) and 6'7" as a sophomore to break the freshman/sophomore record at my school. 4) When do you feel like you made the biggest jump (pun intended) in your events? What do you feel led to your improvements? I think I made the biggest jump in my events going from sophomore year to junior year. Even though I had a bigger improvement going from 8th grade to 9th (7" increase), the improvement from 10th to 11th was greater (6" increase) in my opinion because in 8th grade, I had to partially coach myself. 5) What were some of your accomplishments during your junior season? Biggest highlight? My biggest accomplishment of my junior season was joining the 7 foot club. The highlight of my junior season was making the World Youth team and competing at the World Youth Championships in Cali, Columbia where I placed 3rd in the world with a jump of 7'1". 6) Who are the coaches that have had the biggest impact on your athletic success? The coaches that have had the biggest impact on my athletic success are Steve Nelson-head coach at my high school, Paul Williams-high jump coach/ assistant coach at my high school, and Brunet Lux, head coach of Umoja Track club (the track team I was on before high school). 7) What does a typical week look like for your training wise? How often do you practice each event? How often do you lift weights and do plyometrics? What are some of your toughest workouts? We have high jump practice once a week, and triple jump/ long jump once a week. We lift weights twice a week and do plyometrics once a week after the weightlifting on the first day. Our toughest workouts are the ones we do when we are in load phase, which include 250's and plyometrics and other drills with weighted vests. Some other tough workouts are when we do many repetitions of neuromuscular drills with hurdles. 8) How do you manage your three jump events as well as the hurdles during the meets? Usually, when I do all four events at one meet, it's at a scoring meet (like CCS). Every once in a while in non scoring meets, I manage them by only taking the jumps necessary to either win, pr, score, or place, then move on to the next event. Some days it depends on how I'm feeling, or the order of events. For example, if triple jump and or long jump is before the high jump, I wont take more than three jumps for each one so I can save energy for the high jump. I do this especially for triple since it takes a lot out of you. 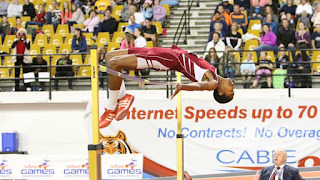 If high jump is before everything else, then sometimes I will do all of the jumps for the other events. Hurdles before high jump acts as a good warm up. 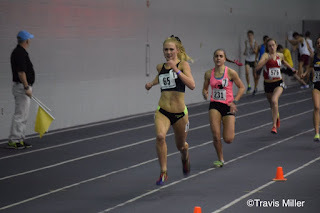 9) This past weekend, you participated at the Simplot Games. How many other years have you attended this meet? Did you know any of your competitors? This was my third and final year competing at Simplot games. I competed from sophomore to senior year there. I didn't know any of my competitors other than a teammate in the hurdles. 10) You will attend the University of Georgia next year. How many other schools did you consider and why did you end up choosing the UGA? 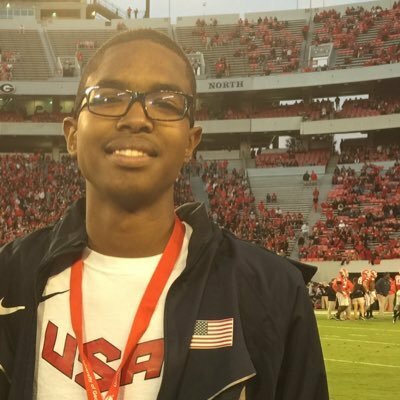 I considered about 5 schools during the recruiting process, but UGA stood out the most. Coach Petros, the head coach at UGA, is known for his many achievements, and his ability to develop athletes to go even further in their track and field careers. This was one of the reasons I ended up choosing UGA, along with me liking the school in general, and the education it provides. 11) What meets are you most looking forward to this coming season? Any post season meets? Any goals you would like to share? 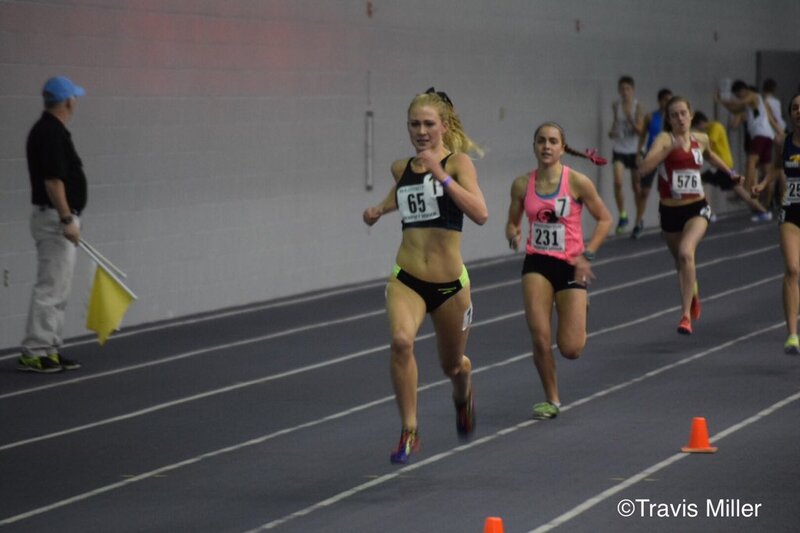 The meets that I am looking most forward to this year are New Balance Indoor Nationals, Arcadia Invitational, State Championships, and World Junior Trials, where I have another chance to possibly make another world team and compete for Team USA again for World Junior Championships. Big day for Elena Bruckner of Valley Christian SJ with throws of 49'7.75" and 171'6". Please add other notable marks for local athletes in the comment section below. 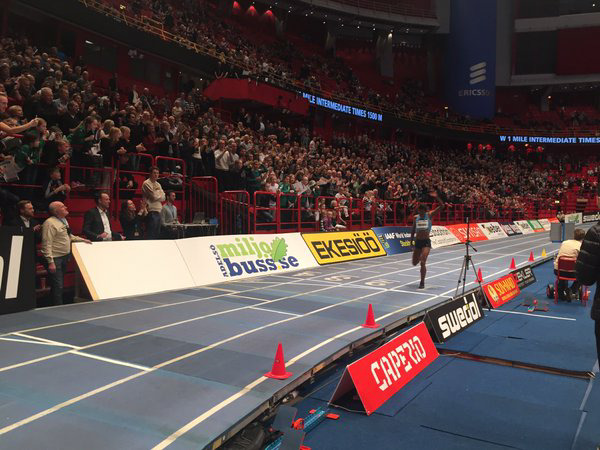 Aside from Drew Hunter's 3:57.81 mile (yawn) at the Millrose games, Darius Carbin of Mt. Pleasant had double victories in high jump (7'0") and triple jump (47'11.25") at Simplot. You will be hearing more about those two this coming season but one of them may be seen live at a local meet. Also participating at Simplot was CATC, a youth track club out of Oakland. Their club members recorded 4th place fineshes in 60h. and 3rd place finishes in TJ, 4 x 200 and 4 x 400. Other performances that are worth mentioning should be added in the comment section below. "Tam High cross country coach Sylvia Goodman was among the 16 California Interscholastic Federation’s Model Coach Award winners for 2015-16 announced on Monday." My interview with Sylvia from 2009 can be found HERE. 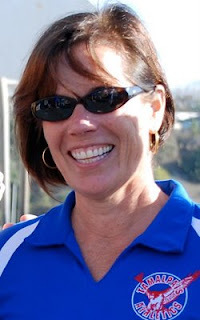 Also named was Kay Nekota, Vacaville HS XC & TF coach and athletic director. A complete list of all the coaches can be found HERE. If anybody can help locate the section records for SF Section, please email a link or the records to albertjcaruana@gmail.com and coachaleong@hotmail.com. For Oakland records updates, email seankohles@gmail.com. At the BU Scarlet and White Invite. Cole ran a personal best 1:50.57 as a senior at the California state meet. He finished in 5th place in the final running 1:50.95. After high school, Cole continued to race at Occidental College for one season before transferring to Georgetown University as a sophomore. He ran 3:42.05 at last year's Payton Jordan meet which qualified him for the NCAA meet. Former Salesian HS (NCS) sprinter Jahvid Best returning to Track and Field after retiring from Football due to concussions. Best sprinted to 10.36 and 20.65 personal bests wind legal marks in high school (both NCS records) before heading to Cal Berkeley and the Detroit Lions to play Football. If its alright, I would like to share my athlete's video with the XC community on CrossCountryExpress. He is a young and aspiring film maker and spent an insurmountable amount of time on the documentary. I believe his audience needs to be widened because of the amount of effort he put into this. The documentary covers our entire 2015 cross country season at Liberty High School. He recently entered an edited down version into the Hollywood International Independent Documentary Awards (HIIDA) and won "Best Feature - Student"! The director, editor, and student athlete of mine is Alec Douglas. The film is called "Running for Pride: A Cross Country Documentary". A couple of video credits in this version of the film include short clips from YouTube from "JesuitTrack" and "Aggiemacks". The video is a cool, 58 minutes long.. but it is a fun video and worth the watch. I believe that the greatest thing about this documentary is that so many other cross country teams can watch it and relate to it! Section 3, Part B, Letter E: CCS athletes, do NOT wear your School Uniform at any All Comer Track Meet, per CCS By-Laws. I would extend that to any athlete from any section. The following is taken from the 2015/2016 CCS By-laws. "The school name, insignia, official colors, equipment, facility and uniforms belong to the school and may not be used in capacity other than in CIF competition as allowed within the CIF, CCS, League and school governing documents. If teams or individuals competing in or practicing with an organization governed by someone other than the CIF, use school names, school mascot names, school uniforms or anything that in any way identifies them with a particular CCS high school, they shall be considered a school team regardless of their affiliation with that outside agency." Today we chat with Santa Cruz High School coach, John Rembao. 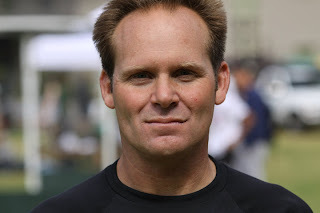 John is one of the best track and field coaches in California who has had success coaching jumps, multi-events and mid and long distance athletes. John has coached at multiple Universities (see below) which you will see below and has directed many events such as the recently completed 2015 USATF Club XC Championships at Golden Gate Park. You can read more about John and his coaching accomplishments at this LINK from the Santa Cruz Track Club. You can also check out this newspaper article about his work with three Chinese high jumpers at this LINK. The following is a lengthy interview but well worth your time if you have an interest in coaching the high jump as well as improving your expertise as a coach in any Track and Field event. 1) What was your athletic experience? I played sports informally until I went to high school. Did well on the President's physical fitness test in middle school. I participated in organized team sports when I attended high school. I went out for cross country and wasn't planning on running track until Coach Brock asked me to run one dual meet at the beginning of track season. After my first race on the oval, I decided track was for me. Mostly because I realized the results would be a direct reflection of what I put into running. That was exciting to me. 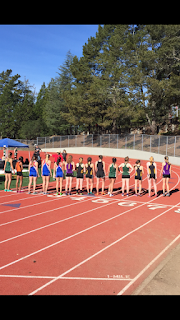 I ran 9:14.3 for the two-mile (county and school record) which placed me second at CCS, 4:21.5 (school record) for the mile, and 15:18 on Crystal Springs XC Course. The two-mile record still stands at Santa Cruz High. Who were the coaches that had the biggest impact on you? The list is long. Every one of these coaches has had a significant impact on me and my coaching. Nick Delurgio was the head track coach and was an extremely organized individual. I appreciated the care and thought he put into creating a well-managed team. He created a team handbook that I referred to often. In fact, it was one of the reasons I created a training manual that I provided to my distance runners and jumpers when I coached collegiately. Greg Brock was my personal coach. Greg ask me a lot of questions which I then tried to find the answer to, through experience and research. This method of asking questions, of myself and others, served me well as a collegiate coach. I had a genuine curiosity in the sport from a young age, and a desire to find answers. Vern Gambetta. He was a close friend of Greg's, and I heard conversations between the two of them that inspired and motivated me to pursue track with a passion. Collegiate-everyone of the coaches listed taught me many things, but I point out the biggest lesson I learned from each of them. Steve Miller taught through example how an inspiring leader can get people to do things they didn't even believe they could do. Lance Harter was my first coach-to-coach mentor and exemplified a pursuit of excellence that stays with me today. Gary Wilson taught me how to have fun, even in the most intense environments. I relied on this lesson at the University of Texas, daily. Bob Meyers mentored me in the high jump. He shared information, provided insight and encouragement. To this day, I think he is one of the most talented high jump coaches this country has ever seen. Deanne Vochatzer helped me to understand that it was okay to make mistakes as long as you learned from them. Brooks Johnson taught me that a good coach can coach anything. I didn't believe him at first, but I found that by applying the same curiosity to the jumps as I had to the middle and long distances, I had just as much, if not more success. Randy Huntington was my first mentor in the long and triple jump. He shared articles, books, and showed me patience as I learned the horizontal jumps. Fred Harvey and I have had more conversations, sometimes arguments, than any other coach I have ever known. He aggressively challenges me daily, without ever making me feel threatened. His ability to make people think about who they are, and what they are doing, helped me become a more focused coach. Scott Evans reminds me that providing honest and truthful feedback to the athlete's in our care is how we honor them and make them better. Curtis Taylor inspires me in his unrelenting pursuit of knowledge and excellence. Peter Tegen probably one of the best coaches this country has ever seen, he taught me to look deeper than what other were saying about training and to challenge the status quo. Joe Vigil took me to lunch at the Olympic Games in 1992 and from that point forward he has always been available to provide insight and encouragement. Frank Gagliano provided me, what I consider being the final piece of the middle distance puzzle. This awakening allowed an athlete to win seven Big XII championships in the three years that I coached her. Lyle Knudson provided me with the opportunity to coach at the Olympic Training Center for ten summers. This experience made me a better coach and mentor and challenged me to under the material I was presenting at a high level. Dan Pfaff and I would talk after practice for hours when I worked at the University of Texas. These conversations motivated me to keep learning. He was an encyclopedia of knowledge and these after practice conversations inspired me to keep learning. Bev Kearney is one of the most competitive people I have ever met, and she was a recruiting genius. She was always thinking about how to be better in all aspects of coaching, and she challenged me to be the very best as a coach. Gary Winkler is one of the most brilliant people I have ever met. How many coaches do you know who have written a math book? Gary took the very complicated language of training and developed what I understand to be the first Level II sprints and hurdle curriculum. He produced the chart, "Speed Inventory - Categorization of Methods and Means," which was part of the Level II curriculum for sprints and hurdle. This chart helped me to understand the nuances of speed work. George Williams is one of the most productive and humble individuals you'll ever meet. As a very successful Olympic coach, why would he ask for advice from anyone? But that was he taught me was that you should never be too proud to ask people for help when trying to understand any event, better. Milan Donley influenced the way I approach working with my son and his athletic development. He is such a great father and husband; I'd like to think he made me a better one. Sheldon Blockburger is an intense coach who is one of the funniest people I have ever met. Sheldon taught me to be able and laugh at myself. Boo Schexnayder have had many interactions over the years. His scientific mind taught me that having a plan and following it is how we learn and grow. He was also an inspiration when it came to running and jumping mechanics. Any coach who wants to be the best should search out his writings. He is brilliant. Jeremy Fischer is another brilliant mind who knows how to coach and motivate athletes to the highest level. It is no mystery why he has coaches athletes to the Olympic stand; he taught me that you can never be too patient. 2) Where did you go to college and what led you into coaching? I went to Cal Poly, SLO. The first coach I had at SLO was Steve Miller. He was an inspirational man and expected excellence from his athletes. After my first year, I took a year off of school for financial reasons, and when I returned a new coach was running the track and cross country programs. The new coach was the reason I started coaching. He was not inspirational or organized, and he would make up workouts at the moment of practice. He was the complete opposite of Coach Miller. So, after a year of trying to make it work, I just realized that it wasn't going to work out for me, so I gave up my scholarship. I loved running, so I decided instead of running I would try to coach. 3) Where was your first coaching job, what did you coach and what did you learn from that experience? Well, I had just relinquished my scholarship, so I walked over to the women's track office to ask the coach if I could volunteer as an assistant coach. The coach was Lance Harter. He asked me some questions, and we talked for a little while until he finally said when the practice was and that he looked forward to seeing me there. Lance had a large group of runners, so my initial position was to manage workouts for the developing athletes in the group. Working with the developing athletes was one of the most significant coaching experiences in my career. Lance would provide the workout, and I would implement them. If I had questions, I would ask him. I learned how to manage a large group of people, and he encouraged me to read a lot of training articles. Over time, I developed relationships with the professors in the exercise physiology department where our athletes tested for MaxVO2 and anaerobic threshold. I appreciate the fact that Lance was never a micro manager and he also provided me access to other successful coaches, some of which I provided in the list earlier. After six years of assisting with Lance, I was asked by the men's track coach to work with the 800m and 1500m runners. 1. Be a cheerleader for every athlete's improvement and celebrate it. 3. Always do what is in the athlete's best interest. It would eventually be in my best interest when they succeeded. 4. Be a good role model for my athletes. Work hard so that they would work hard. Be passionate so they would be passionate. On the administrative side, I learned how to put on cross country meets and track meets. And I mean I did everything! 4) Where did you coach after Cal Poly SLO and what were some of your different roles at each University? I was responsible for all aspects of the women's cross country team, middle and long distance runners and on the field, the women's high jump. I was responsible for monitoring our weight room development. I had some operations responsibilities with the Texas Relays. I was also responsible for starting the Texas Invitational, which one year, had an Olympic caliber 100m field because of Dan Pfaff's training group. I was also responsible for developing a budget for women's track and field at the request from my head coach. I was the women's head cross country coach, Meet Director the WAC XC Championships, and responsible for all the jumping (men and women) and running (women) events on the track. I was responsible for recruiting all of my events. Director of Operations and coached events as directed by the head coach. I was responsible for all aspects of travel, recruiting lists, official and unofficial visits, alumni outreach, and budget development and management. But, my biggest responsibility was meet operations, hosting the Big Meet, the Stanford Invitationals, both Cross Country and Track and Field, and the Pac-10 Championships in Cross Country and Track and Field, and Regional Cross Country Championships. I was responsible for all aspects of the men's and women's jumps (long, triple, and high jump), meet management (Big Meet, Brutus Hamilton and Pac-10 Championships), and all aspects of travel, and budget development and management. 5) What led you into coaching the high jump? While I was still and athlete, I met this girl (Sue McNeal) icing her shins in the ice whirlpool in the training room. She was the best high jumper on the team. Because her event coach took another job, she struggled her last couple of years at SLO. By the time she was going to graduate, we were dating. When she graduated, we talked about moving to another place where she could train. She proposed the idea of me coaching her. I wasn't sure about this plan, mostly because I wanted to marry her more that I wanted to coach her. Also, I was coaching distance runners, and what did I know anything about the high jump. I just didn't think it was a good idea. But she was persistent, and I reached out to Bob Meyers (mentioned earlier) at Arizona, and he agreed to mentor me. It wasn't smooth sailing, at first. But between Bob's mentoring and Sue's innate knowledge of the high jump, it eventually worked out. She jumped her personal best in 1991, jumping 6'5 1/2", a 3 1/2" improvement over her college best and made her first World Championship Team. The next year she made the Olympic Team, and in 1993, she made her second World Championship Team. That is the short version of how I became a high jump coach. 6) Throughout your coaching career, who have been your coaching mentors that you feel had the biggest impact on you as a coach? 7) From your experience in coaching the event, what are the essential elements of being a good high jumper? From a physical perspective, a well trained high jumper needs to have stamina, strength, speed, suppleness, and skill. In terms skill, a jumper should be able to have a consistent run-up. A quick penultimate response. A good lean back and away from the bar at take-off touchdown. The ability to synchronize the free leg and arms (there are many successful versions of arm use) at take-off. And, patience and flexibility on top of the bar. 8) What does a typical week look like for a high jumper? How often are they jumping? We jump three days a week, but one day is a plyometric focused day, where they are learning horizontal jumps mechanics. How many jumps in a typical session? The number of jumps varies with the experience and development of the athlete. It can range from 6 - 24 depending on the individual. Once the quality starts to fall off, we stop jumping and move to other aspects of our training. What is a typical track workout? A typical Monday would start with 800m of skipping and jogging, and then they would perform a comprehensive warm-up that includes many skills I am trying to teach for all the jumps. The warm-up last about 40 minutes and has a general conditioning aspect to it. We transition to fly work on the track (30, 40, or 50's). The number varies depending on the weather and time of year. We then do three sets of turn-runs, focusing up building tempo. Run-run-jumps, focusing on low foot carriage and quick feet. Circle runs, focusing on foot mechanics and running with an open stride. U-runs, focusing on approach rhythm and turn and take-off points. Scissors, focusing on approach rhythm and take-off and free leg mechanics. Then we do a variety of short or long approach jumps depending on the time of year. And then we'll finish with some power development that can range from back-overs into the pit, medicine ball throws or overhead back, or underhand forward shot throws. How many days in the weight room? Three days a week in General Prep. Two to three days a week in Specific Prep. Two days a week in Competition Prep. One to two days a week in Competition phase. What are the key lifts in the weight room? 9) What are some common errors that you see in many high school jumpers and what can they do to fix those errors? 1. planting parallel to the bar. The first can be as simple as telling the athlete to plant toward the back corner of the pit in the direction they are running. I know this is a simplistic instruction, but it is clear and makes the request executable. Sometimes lack of strength can be the reason plant this way. Small numbers of single leg squats can really make a difference in leg strength. I have found this issue falls into one of two categories. The athlete believes the way he/she will go up is by purposely bending the knee, or the take-off leg is just plain weak. Jumping is a result of amortization and the loading of the take-off leg, is a natural occurrence The leg is going to bend when an athlete jumps, assisting in this bend (amortization) usually results in the athlete moving toward the bar quicker during take-off, when they should be going up. 4. not understanding what to do with their arms leading up to, and during take-off. High jumpers are successful with single arm leads, double arm blocks, and 1 1/2 arm blocks, and some even with little to no lifting of the arms. I would do the one that is most natural to the athlete, at least until they are jumping high enough to warrant some change. The arms can provide some helpful elements at take-off. One is to raise the center of mass, create force into the take-off leg, and provide lifting direction at take-off release. Working on arms takes lots of practice and patience. There is timing involved that is challenging to master. 10) You have had a lot of success as a coach. Can you name a few of the ones that stand out to you? Erin Aldrich - High Jump - 4 NCAA National Championships, 7 All-America honors, the collegiate indoor record of 1.97m (6'5.5"), World University Games 2001, World Championship Teams 1997, 2001, 2005, 2007, Olympic Team in 2000. Elizabeth Diaz - Middle Distances - in three years, seven (7) Big XII Championships in the middle distance events indoors and outdoors (800m, 1000m, 1500m, and Mile). 11) What is your recommendation for a young coach that wants to coach one or more of the technique events in Track and Field? Have a curiosity about one technical event you like and immerse yourself in it. It will help you become a better coach in your primary event(s), and eventually other technical events as well. Most importantly, take opportunities to learn from the best! Bob Meyers mentored me and helped me to find the shortest path to success. Of course, I had a lot of motivation to be good at coaching the high jump, which drove me to find answers. Bob wasn't always available, but he would always point me in the right directions. Without his knowledge and wisdom, I would have struggled to understand the high jump and it would have taken me a lot longer to know the event as well as I do. Read a lot and share with people that have your passion. They will always want to talk to you about your chosen event. Keep looking for people to help you. We are all busy, but if you have three or four mentors, you can always get a little bit of time from one of them.